SEATTLE (AP) - Justices on the Washington Supreme Court on Thursday decried what they described as persistent racial bias in jury selection and called for new protections against it, possibly including the abolition of a legal tradition that dates back more than 700 years. In considering the case of a black man who appealed his felony murder conviction, the justices launched into a discussion about race that spanned five opinions and 110 pages. Eight of the nine justices voted to uphold the conviction of Kirk Saintcalle, who complained that prosecutors struck the only potential black juror in his case from the jury pool. However, several justices nevertheless expressed concern about the issues raised, saying race is often a factor – conscious or unconscious – when lawyers use their peremptory challenges to dismiss potential jurors from cases. "Peremptory challenges are used in trial courts throughout this state, often based largely or entirely on racial stereotypes or generalizations," Justice Steven Gonzalez wrote. "As a result, many qualified persons in this state are being excluded from jury service because of race." When lawyers question members of a jury pool in Washington, they can ask prospects to be removed for cause, such as some evidence the juror would not be able to sit impartially on the case. They are also allowed three peremptory challenges, by which they can have jurors removed for no reason at all, as long as the effect is not purposeful discrimination. Gonzalez said peremptory challenges arose in England in the 13th century as a way to make trials more fair. The king was allowed to remove potential jurors for cause – decisions that were considered infallible – and so the defense was allowed some automatic dismissals as well. 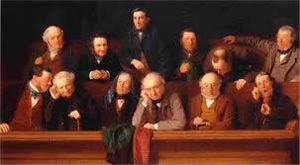 Washington's territorial legislature adopted the tradition more than 150 years ago without debate, he noted, and the state has had them ever since, even though they increase administrative costs by requiring more potential jurors in the jury pool and increase appellate costs by creating more grounds for appeal in criminal cases. Furthermore, he said, there's no evidence that peremptory challenges do any good. Following the late U.S. Supreme Court Justice Thurgood Marshall and current Justice Stephen Breyer, Gonzalez called for the immediate elimination of peremptory challenges, but no other Washington justices joined him Thursday. Instead, in a lead opinion signed by Justice Susan Owens, Justice Charlie Wiggins wrote that the court should not take such a sweeping step in Saintcalle's case, but instead could make new rules to protect against bias in jury selection. Wiggins agreed that the U.S. Supreme Court's 1986 decision in Batson v. Kentucky has failed to eradicate institutional discrimination in jury trials, and that Washington state needs to take additional steps to address the problem. He pointed to studies showing that prosecutors more frequently use their peremptory challenges against potential black jurors, while defense attorneys tend to use them against potential white jurors. "Twenty-six years after Batson, a growing body of evidence shows that racial discrimination remains rampant in jury selection," he wrote. "In part, this is because Batson recognizes only 'purposeful discrimination,' whereas racism is often unintentional, institutional or unconscious." One possible way to address the problem is to allow judges to overrule a peremptory challenge if there is a reasonable probability it was motivated by race, Wiggins wrote. On the other hand, he conceded that the only way to truly fix it might be to get rid of peremptory challenges altogether. Justices Barbara Madsen and Jim Johnson said they too are concerned about the role of race in the justice system, but said the court's analysis in the case should be limited to issues raised by the parties on appeal. Justice Debra Stephens wrote separately to cast doubt on the court's ability to eradicate peremptory challenges through rulemaking procedures, because those challenges are enshrined in state law. Saintcalle's lawyers argued that his conviction should be overturned in the 2007 killing of Anthony Manzo Johnson in an Auburn apartment building. During jury selection, the King County deputy prosecutors singled out the only black person in the jury pool for additional questioning about her views on the role of race in the justice system and because she said a friend of hers had been murdered just two weeks earlier. Ultimately the prosecutors dismissed her, saying it was because she acknowledged she didn't know how her emotions about her friend's death would affect her during the trial. Saintcalle argued that reason was merely a pretext, and that the prosecutors would never have learned about her friend's murder if they had not questioned her because of her race. In upholding the conviction, eight justices said they could not find that excluding the juror was a clear error. Only justice pro tem Tom Chambers said he would grant a new trial. Follow Gene Johnson on Twitter.